A well-timed weekend visit to Beachy Head, staying with Laurence P. We birded the entire headland over the two days and covered c22 km on foot. Pretty careful and concentrated bush bashing revealed great numbers of common migrants but the highlights were 2 Honey Buzzards, moving east two hours apart. The above adult Male bird went straight over our heads a couple of hours after the below bird (looks ad female) had been picked up as a speck in the distance. Both heading east and gaining height, probably in order to cross the channel on a perfect day for it. Totals were as follows; 23 Common Redstart, 1 Black Redstart (juv), 13 Whinchat, 18 Wheatear, 9 Spotted Flycatcher, 2 Pied Flycatcher, 19 Tree Pipit, c60 Yellow Wagtail, 4 Alba Wagtail, 2 Grey Wagtail, 8 Meadow Pipit, 44 Willow Warbler, 1 Chiffchaff, 8 Lesser Whitethroat, 100+ Common Whitethroat, 33 Blackcap, 12 Reed Warbler, 2 Sedge Warbler & a Reed Bunting. Around 2000 hirundine were seen and along with them, 10 Swift. 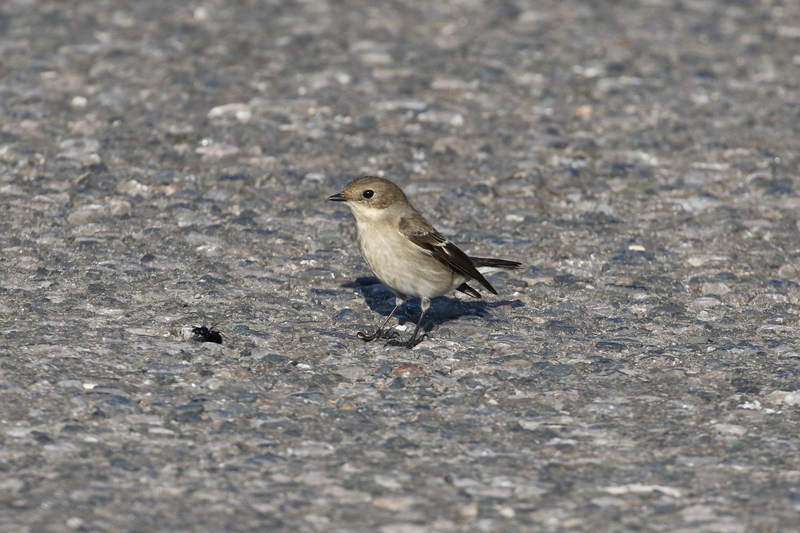 The below juv Pied Flys were particularly settled and I watched them feeding in the hedgerow behind the pub regularly whilst we skywatched on the sunday. A particular favourite of mine and I especially like them like this, preferring autumn plumage or spring females to black and white males. A few waders were heard and seen, all flyovers including a Wood Sandpiper at night on our way to the pub! 3 Dunlin, During the day singles of Golden Plover and Ringed Plover were also noted fly overs.